Ishaani helps RV come out of the car, he looks at her and asks where is he and who is she. He speaks in Gujrati. She keeps hand on his face, he jumps back and doesn’t recognize her. He says who is she, he has to go to his mother. 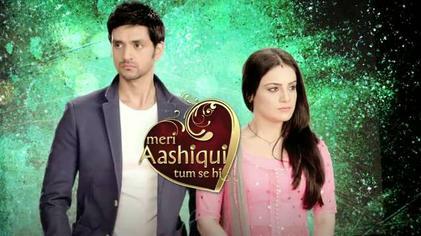 Ishaani fears if he has lost his memory, what will she do now. Ishaani calls him Ranvir, he denies this being his name and recalls his name. Ishaani makes him sit the road side, and brings water from the car. She makes him drink water, she tells him that he is Ranvir, she is Ishaani. She tries to remind him about the past. He doesn’t remember anything. She cries, but he says she wasn’t his friend. She holds his face, and asks him to remind. He says she was a friend, but now she is his wife. 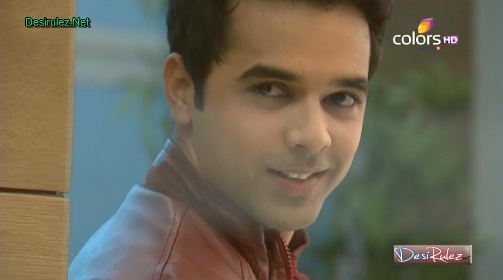 He smiles, that she isn’t Ishaani, she is Sunny. He laughs, looking at her panic. 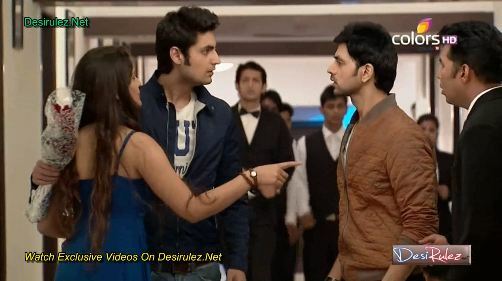 Ishaani holds his neck, while he says he was just joking. Ishaani says it won’t be so easy. RV calls for help, and gets rid of her. She runs behind him, and slips from heels. He holds her, they look into each other’s eyes. She tells him to go away. He says she has to see his face for one whole week. He runs while, she still goes behind him with a rock. Nitin books a room for Falguni, and tells her to go and rest. He will wait for RV and Ishaani here. Falguni is angry that he booked a single room. He says when she is done, she must tell him. He isn’t sharing her room. He will sleep in car, as they can’t afford two rooms. She must go to room, as he doesn’t want RV and Ishaani to see him here. RV and Ishaani come to the hotel, a man comes with the glass of water. RV offers it to her, then says she will only drink his blood. He takes the water, and tells the receptionist to book another room for him. He makes a story that he had a fight with his wife, Ishaani comes back to hand RV’s wallet to him and listens the story. The receptionist apologize that there is no room available. RV thinks he must be ready to do the toss again, tonight. In the room, the lights were off and a lady stood on the window. He thinks she was asking for a separate room and now this drama. He goes to the lady, but she turns out to be someone else. They both shouts, RV runs to switch the lights on. She runs out, RV asks what she is doing. The lady goes asking for someone’s help. People gather there. The man with the lady holds RV with the collar. RV holds him back, warning him not to misbehave. Ishaani comes there. RV says it was a mistake, and he isn’t interested in another lady. Ishaani gets them rid of each other, and qualifies for RV that when he is apologizing why doesn’t he believe. He never looks at other girls, they hold hands. Ishaani calls everyone to leave. Falguni and Nitin watch them, Falguni boasts how Ishaani sides RV. RV thanks Ishaani, and says what she did for him today; she doesn’t need to make cold coffee nor try to say thanks. Ishaani asks if he got the bed, but he says they will toss. Ishaani says she will get an extra bed, for him. In their room, Falguni sits worried. Nitin says that with passing time, they will forget each and everything. Falguni says when they are together; they remember somethings from the past. And Ishaani is a really stubborn girl. Nitin brings her water, saying she got it from her mother. Falguni stands up and says this stubbornness gave her the courage to stand in her decision, and give a good life to Ishaani. She goes to window, that RV helped Ishaani stay happy. She hopes this time, nothing bad happens to him. 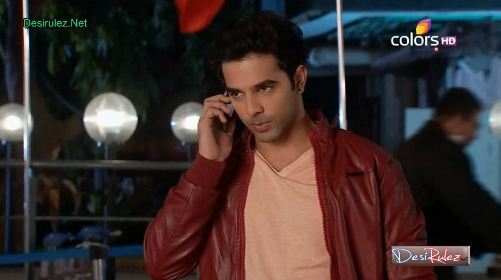 Chiraag tells Disha on call, that he has reached Panjmeshwar. 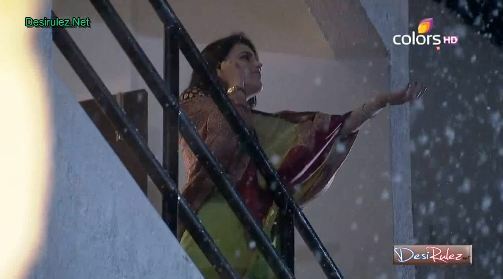 Ishaani waits in her room, RV calls her from downstairs where is was snow falling. He tells her to get her hand bag from downstairs, as it is snowing and it is beautiful. She goes to window, and enjoys. He calls her downstairs, but he says she is already so cold. He teases her to be Sunny, and says he will check the room once more. Parul and Derwash laugh together. She tells him that she did the packing for bhabi as well. She says the honey moons bring husband and wife together. It must be so romantic in Panjmeshwar, as it must be snowing. Derwash asks what else does girls think. She says they think whom will they marry. Ishaani opens her bag, and finds night dresses in it. She is worried, and gets angry that it must be RV’s mischief. She finds a slip in it, that it is from Parul. 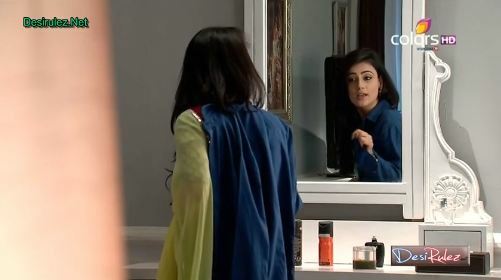 Ishaani worried, what she will wear. PRECAP: The doctor tells Ishaani that she can recognize the man, who brought her papa there. She looks behind and points at the man, saying it is strange she is seeing the man two years later. Ishaani turns to look at RV. Ishaani is worried about what she will wear now. She thinks about looking into Ranvir’s bag, opens it after much struggle. She takes a shirt, gets an idea and goes to mirror. She puts it on her shoulder, and mimics RV’s style and their couple talk. She laughs at her own self. Someone knocks at the door, she hurriedly closes the bags and opens the door. The waiter brings her bag, saying sir gave this. She asks where is sir. He says he has no idea. She thinks about calling him. She wonders why it isn’t reachable. Derwash asks Parul what qualities should there be, in her wish boy. He wonders if he is in her wish list. She says he must be educated, from a well off family, smart and handsome, good looking but might do without the looks as well and must have a job. He thinks he just two qualities, related to looks and she doesn’t want them. She says it is a must that the boy must be hardworking, like her Ranvir bhai. Derwash says listening to her wish list, he thinks he will have to remake his wishlist. Ishaani comes out, and asks a waiter about RV. He says he hasn’t seen him. She comes out in snow fall, and tries his number. Chiraag drives the car, and thinks he will show RV his right place today. RV takes leave from an old man, and thinks Sunny must be waiting if he got the room or not. He crosses Ishaani, but a waiter tells him that he wife went out looking for him. He thinks she must have gone out, to see snow fall. Ishaani tries RV’s number, doesn’t get the line and they both keep on looking for each other. CHiraag thinks that the dump Ishaani would never understand that he can do anything for RV’s money, and he isn’t used to losing. RV comes on the road, Chiraag’s car comes in high speed from behind. RV has an accident, Ishaani’s sindoor comes down. The men shout about the injured man, they tell Ishaani that he was a young man and has been taken to hospital. They couldn’t note the car’s number. Ishaani is worrid, and finds RV’s mobile, she says this isn’t possible. She says he was her husband, and asks about the hospital. She runs there. In the hospital, Ishaani asks about emergency ward. The nurse stops her, as she requests her to go inside. The doctor tells Ishaani that he is really serious; they have to do his operation. Ishaani sits on the bench, crying in shock. Someone keeps hand on her shoulder, it was RV. Ishaani stands up, feels his body and asks if he is alright. She hugs him, RV hugs her back. “Kaun Mera” song plays… He says she must take control of herself, she thought it was him. He says he knows about it, but it wasn’t him. The nurse tells her that they are taking her husband for operation. She blames him, but he tells her that he was looking for her when a car came to him and the man behind him had an accident. He was bleeding, so he brought him here. His phone was left there, and he couldn’t call her. She gives him his phone, he holds her shivering hands in his, and tells her to relax as everything is alright. Ishaani says next time he does so, she will kill him. He mocks her that she was crying so hard just now. Nitin wish Falguni could watch them like this. Chiraag was there in hospital, and thinks he can never do anything wrong to RV. He must make a full proof plan for him. The doctor tells Ishaani that her husband is out of danger. Ishaani tells her that she found her husband alive now, she says she is happy that he is alright now. The doctor recognize her, and says she attended her father that day. She says they were in a confusion that he had a heart attack. She says had that man brought him there earlier, they could have save him. Ishaani asks someone else came with him. The doctor says when he was being taken for surgery, he already had internal organ failure. She says the man had left, when she came to tell them. Ishaani asks can she recognize the man. The doctor says sure, she will. She says this is strange, she is looking the man after two years. The doctor says he is behind her. Chiraag stood hidden behind the wooden wall, while RV stands behind Ishaani. Ishaani is shocked to see him. Chiraag smiles that this doctor is called the God in world, she did what he couldn’t do. The nurse comes to call the doctor. Ishaani thinks Ranvir was there with papa that night. Chiraag comes to Ishaani, she looks at him questioningly. PRECAP: Ishaani says she asked him something for the first time. She say in her first karwa chout, she wants the building from him, where her papa’s office was.